MOUNTAIN VIEW, CALIFORNIA August 25, 2016 – Khan Academy announces today the addition of preschool learning to its digital education offerings. Twenty one mobile apps for children ages two and up, produced by award­winning app maker Duck Duck Moose, are now available for free, like all products from non­profit Khan Academy. Khan Academy’s entry into the preschool learning space is made possible by Duck Duck Moose, whose nine­person team is joining Khan Academy. Duck Duck Moose is donating its 21 early learning apps, which have been downloaded more than ten million times. The Duck Duck Moose team will lead a new initiative at Khan Academy to develop early learning products. Like all Khan Academy initiatives, the effort will be funded by philanthropic support and community donations. Omidyar Network, the philanthropic investment firm, is the first underwriter to join the initiative with an initial $3 million grant. Khan Academy is well known for K­12 and early college education. 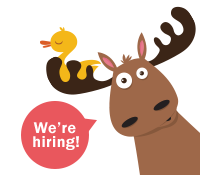 Duck Duck Moose adds a significant portfolio of early learning apps and an award­winning team of engineers, designers and product managers who will develop new apps available for free for young children all over the world. Duck Duck Moose was founded by parents who share a passion for education, design, music and play. Following the launch of its first app, Wheels on the Bus, Duck Duck Moose quickly became an industry leader by creating engaging and educational apps loved by children and trusted by parents and teachers. The company has received numerous Parents’ Choice awards and top ratings. To download Duck Duck Moose apps, visit the App Store or Google Play Store. Khan Academy’s blog has a new post about the Duck Duck Moose partnership. Khan Academy founder Sal Khan and Duck Duck Moose cofounder Caroline Hu Flexer talk about the partnership in this video and host a Facebook live chat today at 4 pm PT. Khan Academy and Duck Duck Moose are accepting donations to make a free, world­class education available for anyone, anywhere. Khan Academy is a nonprofit with a mission to provide a free, world­class education for anyone, anywhere. We believe learners of all ages should have unlimited access to free educational content they can master at their own pace. We use intelligent software, deep data analytics and intuitive user interfaces to help students and teachers around the world. Our resources cover preschool through early college education, including math, biology, chemistry, physics, economics, finance, history, grammar and more. We offer free personalized SAT test prep in partnership with the test developer, the College Board. Khan Academy has been translated into dozens of languages, and 100 million people use our platform worldwide every year. For more information, visit www.khanacademy.org, join us on Facebook or follow us on Twitter at @khanacademy. And remember, you can learn anything.